This work, designed to be held aloft in a public procession, functioned as an emblem of a cofradía, or religious fraternity. Measuring 45.7 cm (18 inches) in height, it is marked by designs, which are relatively simple for the early 18th century, that depend upon both high and low relief: deep punch marks contrast with convex forms and incised lines. The swirling forms that frame the central image are decorative motifs, familiar in silver working in the 18th century in Spanish America. At the center of the emblem, enclosed within an arch, stands the Virgin Mary with the Christ child in her arms. She wears a crown and holds roses, her commonly associated flower. On the opposite side of the emblem (not seen in this photograph), St. Joseph appears with the Christ child at his side. Supported upon a pole, the emblem could have been carried into the streets and held high above the heads of those who marched in public processions. Details of the commission—made for a cofradía—are written along the base. This emblem was made of thin sheets of silver, hammered over a raised design (perhaps carved from a block of wood). The technique is called embossing, and it allows wide range of decorative possibilities with a minimum use of precious metal. 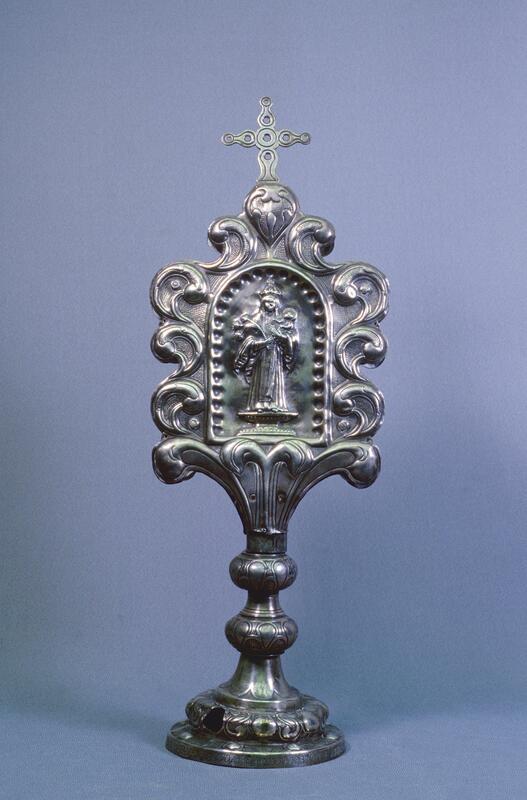 Across Spanish America, silver was the preferred medium for religious objects—both for objects used in mass and those for public processions and displays. 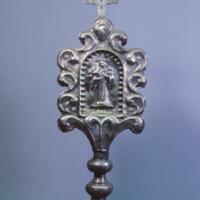 This relatively humble work stands in contrast to emblems, processional banners and other ritual objects commissioned by wealthy urban cofradías which were created with greater care, often delicate and elaborate imagery and, not surprisingly, more silver (and, sometimes, gold and jewels). The inscription at the bottom of this work reveals it was made for a cofradía in 1723, probably to carry in a public procession. Scholars believe the emblem was made in, and used by people living in what is now Guatemala, and today the emblem is housed in the Museo Popol Vuh, in Guatemala City, Guatemala. Cofradías were important social and religious organizations across Spanish America. They provided not only a sense of solidarity but also financial and other forms of support for their members—sponsoring funerals and masses as well as altars for their patron saints. In the political arena, cofradías helped to define and organize civic life. While the institution of the cofradía originated in Europe, they were taken up by all classes of society in Spanish America, including urban indigenous groups. The iconography and craftsmanship of this particular emblem are simple, yet they reveal how important cofradía displays were across social ranks. Beyond this, the emblem demonstrates how silversmiths might be enlisted to serve humble patrons and community groups, not strictly those at the upper echelons of society. Esteras Martín, Cristina. 1994. La platería en el Reino de Guatemala, siglos XVI-XIX. Guatemala: Fundación Albergue Hermano Pedro. Webster, Susan Verdi. 2002. “Las cofradías y su mecenazgo artístico durante la colonia.” In Arte de la real Audiencia de Quito, siglos XVII-XIX. A. Kennedy, ed. Hondarribia, Spain: Editorial Nerea.